Intensely individualistic Champagnes from The Aube. Wines first, Champagne second. Bertrand Gautherot, located in Buxières-sur-Arce, has 5 hectares of vines in the Aube in the far south of Champagne. He started tended his vines in 1986, started going biodynamic in 1996, and sold his grapes until 2001 when he decided to make his own wines (allegedly with the encouragement of Anselme Selosse of Jacques Selosse). He highly restricts yields and meticulously maintains his vineyards. Vouette and Sorbees wines are very naturally made: barrel fermentation, indigenous yeasts, no dosage, no fining, no filtering, no cold stabilization, etc. and with a minimum of sulphur. These are wild wines. They are not for everyone; you might have more luck convincing a non-wine geek or foodie that the Saignée de Sorbée is red wine or a bold ale than Champagne for example. Blanc d'Argile is all Chardonnay from Biaunes. It is described as similar to Chablis in its minerality. Fidèle is 100% Pinot Noir from Vouette and Biaunes, known for its minerality as well as big Pinot flavors. 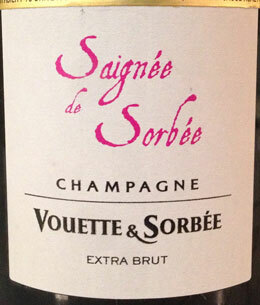 Saignée de Sorbée is an all Pinot Noir whole cluster fermented Rose made by the saignée (skin contact) method. It is made in tiny amounts and pretty wild! See the tasting notes below. Tasting Note: Blanc d'Argile - June 2015. This rates a B-. Tempted to not rate and I would like to retry; perhaps a flawed bottle but I really can't tell (don't think so). These wines are so distinctive and bizarre. Tasting notes I find seem to confirm both people loving and hating this wine. Once again, more wine than sparkling wine. An odd wine indeed, much like the Saignée de Sorbée below. The nose is reductive with cantaloupe, honey dew melon, and apple peel. Minerals indeed, but more fruit. Plenty of minerals on the palate and crisp apple. Lovely minerals yet a slight sourness mixed with a glowing warmness which is odd to say the least! I'm glad this bottle is done! (that does say something significant). Must retry sometime. Tasting Note: Fidèle - June 2015, rated A- and I like this much better than the Saignée de Sorbée below! Not as unique certainly but it rocks! Based on the 2009 vintage, disgorged 6 April 2012 (06-04-12/R09 on the label). A rich yellow color with a tinge of orange. Lots of small bubbles initially, unlike the Saignée de Sorbée below, but after about an hour it is closer to a still wine - that is not a complaint or shortcoming for this wine! Palate is full bodied with strawberries, cherries, ripe and bold apples, some tropical fruits, perhaps kiwis. Stupendous! Tasting Note: Saignée de Sorbée - June 2015, rated B+ although it is so wild I'm not sure how to rate this! A unique wine. Based on the 2009 vintage, disgorged 21 Nov 2011 (21-11-11/R09 on the label). I was not expecting such a rich, red, mahogany color! 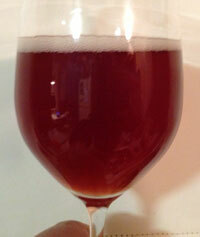 The nose initially was apple cider, almost apple cider mulled with spices. With air, minerals, chalk, and strawberries among other red fruits emerged. The palate was spicy and intense with ripe apples and a nice core of sweet mouth puckering yet dry red fruits. Others have written "game and tobacco" and I can understand that although my notes do not include those descriptors.